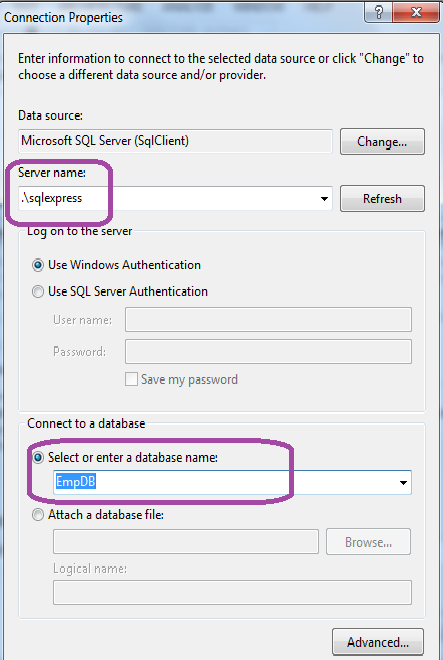 In this article we are going to focus on how to join three database tables using LINQ. As we know in order to join three tables we need a common column in the tables using which we can join the tables and get the required columns. Usually we join two tables using a Foreign key of one table and Primary key of another table. In this article we will join Emp table with EmpCourse table and then join Course table with the EmpCourse table to get all the courses enrolled by the employee. 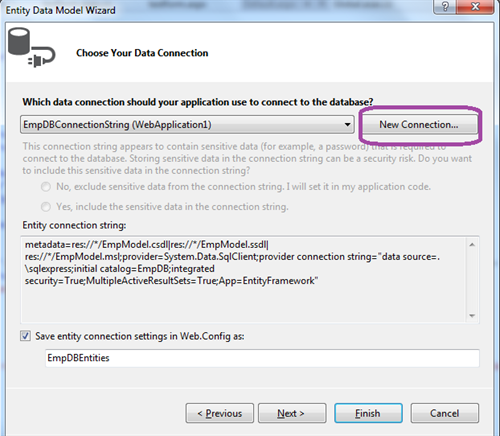 In this article we are going to focus on how to join two database tables using LINQ. As we know in order to join two table we need a common column in both the tables using which we can join the two tables and get the required columns. Usually we join two tables using a Foreign key of one table and Primary key of another table. In this article we will join Emp table with Course table to get all the courses enrolled by the employee. 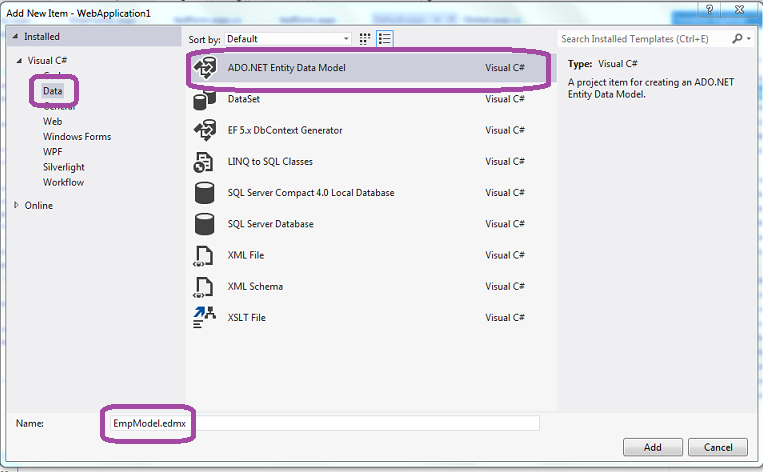 Step 2:Open Solution Explorer -> Right Click on the project -> Add -> New Item -> Select -> Data on the left side -> select ADO.NET Entity Data Model -> name it EmpModel.edmx. 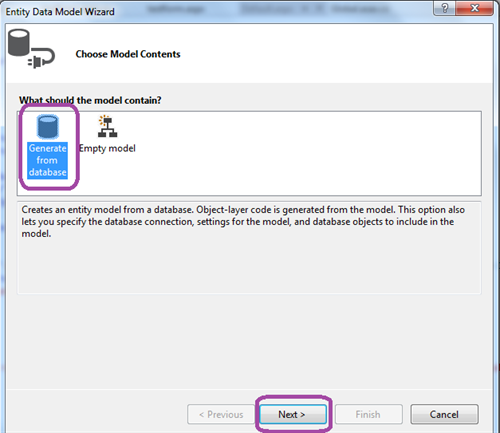 In Entity Data Model Wizard dialog box select Generate from database. Click on next -> In the Choose your data connection window select the New Connection -> Type .\sqlexpress for the server name and then select the "EmpDB" database from the "Select or enter a database name" dropdown. Now Expand tables and then select Emp, Course, and EmpCourse tables and the click on Finish. 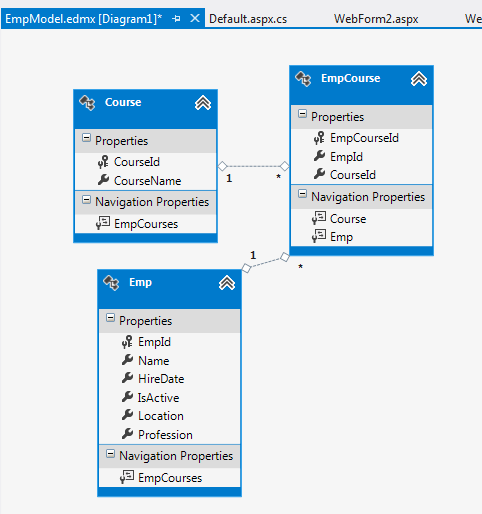 Then you can see all the three tables in the EmpModel.edmx designer window. Here we have taken a TextBox, User will enter the EmpId in the textbox for which user want to see all the courses enrolled by the employee. In the above code, First we are creating a context to access the entities in the EmpDB database using EmpDBEntities db = new EmpDBEntities(). Then we are using two joins to join three tables:Emp,EmpCourse and Course tables to get the CourseID and CourseName of the courses enrolled by a specific Employee with the EmpID entered in the textbox. 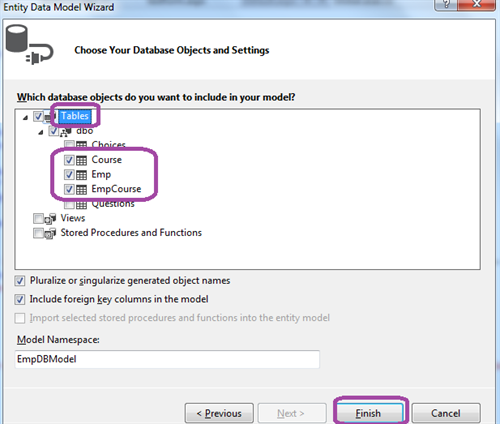 First join is used to join Emp table and EmpCourse Table to get the Courses for the Employee with an EmpId. Then we join Course table with EmpCourse table to get the CourseName and CourseId from the Course table of that Employee. The we are converting the result to a list and binding it as a datasource to the GridView "gvCourseDetails".